Although equipment choice is intensely personal, it's always good to know what other people use and I've picked up some excellent tips over the years from fellow walkers that I'd otherwise have missed. 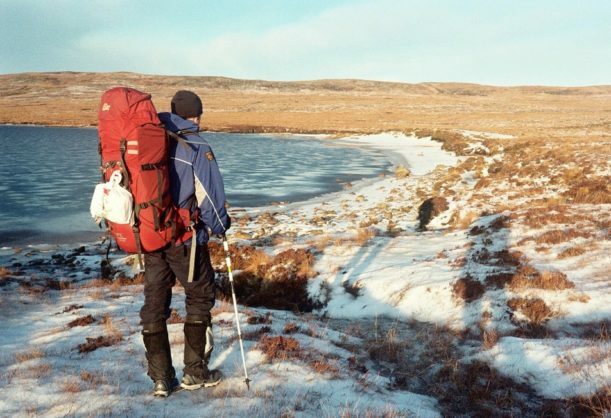 When I first started walking in Scotland 20 years ago, we had college issue neoprene waterproofs, old school Karrimor sacks and Vango AFrame tents. The strange thing is, I don't remember being uncomfortable or feeling that we were poorly equipped. I've become a bit weary of late with the growing obsession with gear that has gripped our industry. Maybe it's because we've got more time and disposable income to devote to such things, but part of me hankers for simpler days when we didn't obsess over grammes and materials so much. Marketing has played a strong role in making us feel like what we have is inadequate, prodding us to buy the latest wonder gear. I'm as guilty of this as anybody and my kit locker is full of impulse purchases that haven't stood the test of time and the elements. The equipment I've listed below is what I use. Most of it has been tested to, and sometimes beyond, destruction. I know it works for me. It may not always be the lightest stuff around, but the north west of Scotland is no place to mess around. Some of it would be overkill in other places. It's year round gear, so in summer months you may be able to get away with less. Tarptent Scarp One For many years I used the Hilleberg Akto. Like the Tarptent, it was re-assuringly bombproof and I find it hard to criticise a shelter that has seen me through so many tough nights when lesser tents would have crumpled. But it was rather prone to condensation, pronounced in cold and snowy conditions which is what led me to reluctantly sell it. The Tarptent I've replaced it with is similar in many ways to the Akto, but has two porches which is a real advantage. I generally chuck all my wet gear in one porch and use the other to cook. It also vents better, so is less prone to condensation and is slightly easier to pitch on rough ground. I've not joined the recent craze for tarp type shelters like Mountain Laurel Designs' Trailstar, but people I respect swear by them, so they are also worth considering. Vargo titanium pegs I bought these a while back in a fit of titanium lust. They weigh practically nothing. I use a combination of the nail type and v-shaped pegs for softer ground. Alpkit do similar but cheaper aluminium nail pegs. PH Designs Minim 500 down Sleeping bag For years I used a heavy Buffalo pile bag after a few wet and cold experiences in an old down bag. Eventually I succumbed to down again and got this bag in one of PH Designs' occasional sales. It is rated to -11, but I've used it down to -20 with clothes and a silk liner. Thermarest NeoAir I was initially sceptical as the sample I checked out seemed flimsy but this has turned out to be a game changing piece of kit. It epitomises what lightweight technology should do - increase comfort and function whilst reducing weight with little or no sacrafice in terms of durability. I've heard some complaints about the mat's insulating properties, but I've camped on ice with only a groundsheet beneath it and didn't have any heat loss problems. Lowe Alpine TFX Expedition 75+20 This is a bit of a beast and would probably bring lightweight enthusiasts out in a rash. The pack alone weighs a couple of kilogrammes, but it is absolutely bomb proof. On a long trip like the CWT you need a solid load carrier that can swallow a week or more of provisions. My sack is a few years old now and there may be better options on the market, the big Go Lite sacks in particular are worth looking at. But this sack has shrugged off a tremendous amount of abuse so will be with me for a few years yet. OMM Trio Chest Pouch This is a really versatile bit of kit that allows me to carry my daily food, camera and compass on my chest. It also has a handy pocket I can slide a laminated map into. This means less stopping which is a definite advantage when carrying a heavy pack. Paramo Velez Adventure Light / Aspira smock & trousers These are absolutely superb performers. This is not the place to go into the various arguments about breathable waterproofs (besides which, Andy Kirkpatrick pretty much wrote the last word on that), but I have always found Paramo's performance to be superior in the very worst conditions. I started out on my winter expeditions using the Aspira smock and trousers. It's warm gear to be sure (often cited as a disadvatage). I've worn the smock with only a merino base layer in -24 windchill. When Paramo brought out the Velez Adventre light range, I immediately tried them. The trousers get worn from dawn to dusk (and are much better cut than previous bag-tastic versions) and the smock is thinner, lighter and therefore more versatile. I often wear it all day as a fleece/windproof over a merino base layer. Mammut Basejump pants Great backup trousers (I particularly like the massive range of sizes Mammut seem to provide). Fairly light, stretchy and superb quality (but not cheap). Chocolate Fish Taranaki merino base layers (top and long johns, pants) After expensive merino baselayers from Icebreaker and Howies ended up in holes after a short space of time, I started to look for something with better quality. It became apparent that a lot of the big manufacturers get their stuff made in China and perhaps lose full control of quality. And then I found Chocolate Fish, a small manufacturer of some of the best garments I have ever worn. The quality is superb, as is the service. The price is well worth paying. When the weather is looking particularly cold, I throw in a pair of long johns. Rab Baseline hoodie If the weather is too warm for the Paramo Velez smock, I often walk in just the Baseline. It's well made and well cut like a lot of Rab products. The hood add's a bit of extra warmth if the wind whips up. I quite often wear this on its own, with no base layer. Montane Slipstream GL Smock I use this mainly for ultra marathon running, but it has crept into my walking as well. I sometimes chuck this on over the Baseline hoodie for a bit of extra windproofing when it's really blowing, but not raining. It's also good around camp (as it's showerproof). A very flexible and functional bit of kit. PH Designs Minim down gilet This is a good few years old now and is a staple bit of kit. It uses high performance 900 down, and is very warm for almost no weight. Usually the first thing I put on in camp. PH Designs Sigma pullover I use this in conjunction with the down gillet (usually over the top) to provide top quality, weatherproof insulation. It uses artifical Thinsulate insulation that is more water resist than down. It's a few years old now and there are lighter and less bulky alternatives on the market (artificially insulated jackets currently seem all the rage), but this has served me faithfully. Drymax socks It's probably fair to say that over the last few years I've conducted a fairly obsessive quest to find the best socks for the Cape Wrath Trail. The frequent river crossings and rough terrain make the choice of sock particularly important. In the end, it was my ultra running that led me to the perfect sock. Made by Drymax, their trail socks are designed for long races where the foot is frequentlty immersed in water. The only problem is that they are not available in the UK (try eBay). The next best I have tried are Wigwam's silk/merino/nylon mix socks. Rocky Goretex waterproof socks Another US only product, but these are worth their weight in gold. They are the best waterproof socks I've tried bar none. They can make all the difference on days when you're in and out of rivers or bogs on a regular basis. Gaiters I've never really found a gaiter that I've got on with. I've tried the Berghaus Yeti gaiters, but found that they tended to slow the drying of boots after repeated river crossings. My current pair are bog standard Berghaus. They do the job, but aren't very well made. I've got my eye on Hillsound's Super Armadillo Nano gaiters when they're released in this country. One other point to consider is that in snow and freezing conditions, velcro stops functioning well. Some newer gaiters that rely solely on velcro are not a good option. Boots One of the features of the Cape Wrath Trail is frequent river crossings, making the choice of boot particularly important. Over the years, I've tried a few variations. I've used a traditional leather boot which never really dried out properly and caused rubbing problems. I tried the ultra lightweight Montrail Hardrock Mid boot, a very light and fast drying boot. This was an improvement, but offered very little ankle support and disintergrated quite severely in some places after only a couple of weeks of use. I've settled on the eye wateringly expensive Haglofs Grym boot. The boot uppers are made from a new synthetic material called Superfabric. My experiece so far has been superlative. They are very light (but offer the support of a "traditional" mountain boot), fast drying and highly waterproof. They are without question the best pair of boots I have ever worn, and will last me many years. Rab Power Stretch Gloves Rab was one of the first manufacturers to use Polartec's Powerstretch fabric, and the gloves are still going strong. They still provide some insulation even when wringing wet. Latex gloves On my winter trips, I use surgical latex gloves to break camp on frozen/snowy mornings. This might sound bizarre, but they keep the worst of the cold away from your hands while you pack the tent and pull out pegs and keep other gloves dry to put on later. Montane Extreme mitts Another winter bit of gear - a bit like my faithful old Buffalo mitts but with extra material on the palm which was rather prone to wear. Mountain Equipment Gore Tex over mitts I'll take these if the forecast is very wet as they can be useful in all day torrential rain. OutdoorDesigns Ninja Balaclava Useful in very cold and windy conditions. Always something you're tempted to leave at home but was incredibly glad of this piece of kit on Ben More in a day long white out blizzard. I also like the fact that in my head it makes me look a bit like a ninja. Can be used just as a hat or a neck gaiter, so is quite versatile. Haglofs powerstretch beanie Basic hat in Powersretch. Primus Express Spider stove It took me years to abandon my trusty Trangia and I never really got on with the Jetboil stove I replaced it with. The Primus is very light and easy to pack as a unit. It boils water quickly and has a loop that warms the gas before it hits the burner (handy when it gets cooler). Real Turmat expedition meals (freeze dried) I've tried pretty much every expedition meal going over the years and these are by far the best of the freeze dried options. Wayfarer meals are ok, but much heavier. Other food My strategy is to eat little and often and make sure things are handy for keeping going when the weather is too foul to stop. Canon Powershot G9 camera Good cross between SLR and compact. Delicate lens, broke this slipping on ice on Sandwood beach! Camelbak antidote 2L hydration system I've had some freezing problems, but you can get an insulating kit. Usually fill at end of the day so it's ready to go in the morning. Waterproof matches, gas lighter, fire steel All bases covered. Dry bags A wide selection - Ortlieb compression dry bag, Exped. Kahtoola lightweight crampons Mistakenly sent these home unused from Ullapool, would have come in very handy on the last leg of the big winter trip. Leki retractable trek pole Old and knackered. Hankering after some carbon. Garmin GPSmap 62s Not used much, but was a re-assurance in white out blizzards in Sutherland. Full UK OS 1:50,000 mapping on an SD card. iPhone Podcasts & films help with the long dark nights. Experimented with Social Hiking, but not really practical on the remote bits of the trail. A good book When the phone battery inevitably runs out! Diary For keeping route notes - I like Field Notes. Colour printed A4 route sections Printed when no one's looking at work. Sealine A4 Map case Designed for kayakers, but worth the extra weight as I've broken and ripped so many others over the years, heavy, but idiot proof and durable. Sign up for occasional email updates with news and updates from the trail.